Originally released in 1970, this was the fourth release from the British folk-rock group Pentangle and may qualify as their swan song. With only five songs, Jacqui McShee, Bert Jansch, John Renbourn, Terry Cox, and Danny Thompson create a dense, layered sound that is woven within the fabric of each song like a tapestry. Although known for their eclectic approach and love of jazz, here the group concentrates on traditional material like "A Maid That's Deep in Love" and the 18-minute "Jack Orion." A Pentangle fan will immediately note that John Renbourn is playing an electric guitar on "A Maid That's Deep in Love." This departure from purely acoustic doesn't create a bigger Fairport Convention or Steeleye Span sound but is imbedded quietly into the song. What really sets both this song and "When I Was in My Prime" apart is McShee's clear, vibrant vocals. On "When I Was in My Prime," she sings unaccompanied, proving that her talent runs as deep as the better-known Jansch and Renbourn. The seven-minute title cut also features McShee singing an absolutely lovely ballad with darker undertones. Jansch sings the enjoyable though straightforward "Lord Franklin." The crowning jewel of this masterpiece is the epic "Jack Orion," though one has difficulty imagining what possessed Pentangle to record a folk song that took up an entire side of an album. Jansch shares vocals with McShee on this multiple part song, and generous time is left for Renbourn to turn in a bluesy, then jazzy, electric solo. 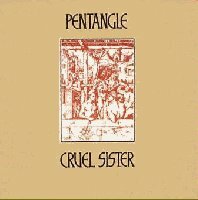 Cruel Sister shows Pentangle at their artistic height, combining all of their skill and inspiration to create a vital and enduring album.